There will be top drama, plays, comedians and musicals coming to Northampton with the announcement of the new season at the Royal & Derngate. Following on from Death of a Salesman, Royal & Derngate’s Made in Northampton 2017 season continues in September with the regional premiere of Sam Holcroft’s hilarious comedy Rules for Living which was a previous smash hit at the National Theatre. The theatre welcomes back its former associate director, Evening Standard Award-winning Simon Godwin to direct this brilliant and darkly funny play that explores what happens when an extended family gathers for a traditional Christmas dinner. This brand new production is brought to the stage in conjunction with English Touring Theatre and Rose Theatre Kingston, with whom Royal & Derngate won the 2016 UK Theatre Award for Best Touring Theatre for The Herbal Bed. Premiering first at the Edinburgh Festival Fringe before coming to Northampton in October, Education, Education, Education is a love letter to the halcyon ‘90s schooldays and a tribute to the teachers who were probably just as confused as their pupils. The show is devised by critically acclaimed company The Wardrobe Ensemble and co-directed by Royal & Derngate’s former RYTDS Director in Residence, Jesse Jones, using the company’s trademark inventive theatricality and irreverent humour. Harold Pinter’s 20th century masterpiece The Caretaker explores everyone’s search for a sense of belonging in a world where the line between truth and reality is constantly in flux. Directed by Christopher Haydon, with Patrice Naiambana (Othello at the RSC) in the title role, this bold new co-production with Bristol Old Vic explores the paranoia of living in an ever-changing landscape. The Made in Northampton season continues in the Spring with a new adaptation of E.M. Forster’s A Passage to India created by the breath-taking young ensemble company simple8, followed by Agatha Christie’s Love From a Stranger, with Lucy Bailey returning to direct in Northampton after the huge success of Gaslight in 2015. Complementing its Made in Northampton programme, the Royal auditorium also plays host to some of the very best touring drama. Having taken the world by storm when it premiered in 1986, Willy Russell’s heart-warming comedy Shirley Valentine has become a national treasure with its uplifting tale of the disillusioned Liverpool housewife who escapes to Greece and starts to see herself – and the world – very differently. Also enjoying a major revival, directed by Max Stafford-Clark, Andrea Dunbar’s semi-autobiographical play Rita, Sue and Bob Too is a vivid portrait of two school girls caught between a brutal childhood and an unpromising future. For one night only, there is a chance to see Austentatious – The Improvised Jane Austen Novel, based on a title suggested by the audience on the night, and Michael Mears’ gripping one-man show This Evil Thing telling the shocking and inspiring story of the men who in 1916 said ‘no’ to war. Looking ahead to next year, there is a chance to see the John Steinbeck classic, Of Mice and Men. Coming to Derngate auditorium this Autumn is the National Theatre’s acclaimed new production of Ibsen’s masterpiece Hedda Gabler, adapted by the playwright Patrick Marber and directed by Ivo van Hove, with Lizzy Watts playing the free-spirited Hedda, one of the greatest dramatic parts in theatre. Tickets are also now on sale for the hilarious comedy The Play That Goes Wrong (a huge success in the Royal in 2014 and now a world-wide phenomenon) and the Royal Shakespeare Company’s critically acclaimed production of Hamlet, starring Paapa Essiedu. For musical lovers comes the Broadway and West End hit, Legally Blonde The Musical, based on the much-loved movie, and starring Lucie Jones (who sang the UK’s Eurovision entry this year), EastEnders’ Rita Simons and Coronation Street’s Bill Ward, in an all-singing, all-dancing romantic comedy. This Autumn also sees the return of Willy Russell’s legendary Blood Brothers, starring Lyn Paul (who rose to fame in the New Seekers) in the moving tale of twins who are separated at birth. Northampton Musical Theatre Company also present the magical family musical The Wizard of Oz in the October half-term week. Looking ahead to Spring the ultimate feel-good party musical Mamma Mia! comes to Northampton, featuring the hit music of ABBA, along with the blockbuster family show, Shrek The Musical, and the new musical by Tim Firth, The Band, featuring the winners of the BBC’s Let in Shine programme and the music of Take That. A great comedy line up in Derngate auditorium includes king of the one-liners Milton Jones with his brand new show Milton Jones is Out There, and second chances to see Lee Nelson’s Serious Joker and Stewart Lee’s Content Provider, while only limited tickets remain available for John Bishop and Jason Manford’s work-in- progress performances. Taking to the Royal stage is the hilarious Andy Parsons with his latest show Peak Bull Sh*t and Simon Amstell with his deeply personal and funny show What is This? Laidback Eurasian stand-up comic Phil Wang presents an intimate gig in the theatre's Underground, where Screaming Blue Murder also continues to feature many of comedy's rising stars in its fortnightly Comedy Club nights. Legends of television, show business and The Royal Variety Performance, Des O’Connor and Jimmy Tarbuck come together to reminisce and entertain, accompanied by music and video. Ruby Wax brings her one-woman show Frazzled, based on her best-selling book A Mindfulness Guide for the Frazzled. Woodsman, author and TV presenter Ray Mears explores his fascination with the wilderness in Born to Go Wild. Broadcaster and best-selling writer Stuart Maconie shares the journey he made in 2016, when he walked the 300 miles from Jarrow to London, retracing the famous Jarrow Crusade. Star of Storage Hunters, the ever-smiling, ever-shouting auctioneer Sean Kelly gives an insight into his life in a raw and funny show, which culminates in an auction finale. For something else a bit different, award-winning professional drinks experts The Thinking Drinkers present a hilarious, time-travelling journey through our drink-drenched past in the History of Alcohol. Royal & Derngate’s regular Behind the Curtain theatrical backstage tours continue, exploring the history of the Royal, and in run up to Halloween there will be also be an evening of Ghost Tours, part-tour, part-performance exploring some of the mysterious happenings and unexplained events that have been reported in this historical building. At a separate Ghost Hunt event there will be the chance to meet the UK’s most exclusive paranormal research team, UK Haunted. Among the musical highlights of the Autumn are gigs from Shane Filan, who has made a name for himself as a solo artist after huge success with Westlife, the legendary Beverley Knight, fresh from six months in hit musical The Bodyguard, the renowned singer, song-writer and actress Lulu, musical master of ceremonies Jools Holland with his Rhythm and Blues Orchestra and rock ‘n’ roll legend Joe Brown. Celebrating 60 years in the business, Marty Wilde returns with The Solid Gold Rock ‘n’ Roll Show, while in Jasper Carrott’s Stand Up and Rock, the comedian introduces some of his musical compatriots who have been rocking audiences around the world, in a mix of stand up and music. A new season in the Underground Studio, NC Jazz Presents, brings intimate performances by The Dave O’Higgins Quartet, The Karen Sharp Quartet and The Art Themen Quintet. The Astor Big Band returns to the Derngate stage with Miller Plays the Musicals, featuring a host of Glenn Miller classics. Musical theatre group Collabro, winners of Britain’s Got Talent in 2014, come back to Northampton on their third nationwide tour, Home. Royal & Derngate's Orchestral Season continues in October with the annual Arnold Festival Gala Concert, featuring the Royal Philharmonic Orchestra, as the culmination of the 12th Malcolm Arnold Festival Weekend, celebrating the work of the prolific Northampton-born composer. Further performances from the RPO include Francesca Dego performing Bruch’s Violin Concerto. The Four Seasons by Candlelight offers a sublime programme of musical classics in an evocative candlelit-style setting. Acclaimed counter tenor James Laing is joined by soprano Becky Bertone for Arias, an exquisite evening of music in the Royal auditorium. There will also be more opera to come in March with Ellen Kent’s production of Madama Butterfly. The acclaimed Richard Alston Dance Company returns to the Derngate stage, with a programme including Alston’s newest dance Carnaval, to music by Schumann, played live by pianist Jason Ridgway. Rip it Up – Dancing Through the ‘50s sees Strictly champions Jay McGuiness and Louis Smith, together with Strictly professional Natalie Lowe, join BBC Radio 2’s Leo Green, plus musicians, dancers and singers, to dance their way through the greatest songs from the 1950s. Royal Ballet perform for one night only, with The Russian State Ballet of Siberia presenting two enchanting and well-loved ballets, Swan Lake and Romeo and Juliet, in February. Family entertainment coming up includes a stunning new stage production of E. Nesbit’s classic novel The Railway Children and the Olivier Award-nominated musical play The Tiger Who Came to Tea, based on the well-loved picture book by Judith Kerr. There is also another chance to see Stick Man, the award-winning stage show adapted from the book by Julia Donaldson and Axel Scheffler, featuring a trio of actors and delightful puppetry and songs. Looking ahead to the Spring, there will be more family fun with Winnie and Wilbur, and David Walliams’ Awful Auntie. The festive season brings a great choice of family entertainment, starting with the Made In Northampton Christmas show for the Royal stage, a vivid new adaptation of Rudyard Kipling’s family classic The Jungle Book, packed with memorable characters, new songs and brilliant storytelling. 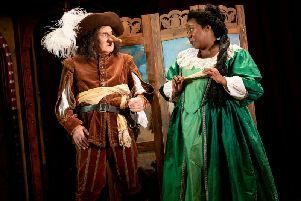 This wild and funny tale has been adapted by Jessica Swale (who wrote the hit play Nell Gwynn), with music by acclaimed songwriter Joe Stilgoe, and is directed by Max Webster (The Lorax at The Old Vic). It can be seen from Tuesday 28 November to Sunday 31 December. In the Underground Studio from Saturday 2 December to Saturday 13 January, Julia Donaldson and Lydia Monks’ enormously popular story The Singing Mermaid is brought to life, through beautiful puppetry and performance, with music by Barb Jungr, in a co-production with Little Angel Theatre, ideal for under 7s to enjoy with their families. Coming to the Derngate stage this Christmas, Aladdin is this year's spectacular family pantomime, running from Friday 8 to Sunday 31 December. The cast is led by stage and TV star Paul Nicholas, Jaymi Hensley from boyband Union J, Three Degrees singer Sheila Ferguson and comedian Kev Orkian. As ever, the pantomime features stunning scenery and costumes, incredible music and dancing, and fantastic special effects.